Men may age better than women, but even they need some help. The most common and age-old problem for men is thinning hair. There’s no cure for baldness but surgical hair restoration, which takes donor hair from other areas of the head and moves it to the thinning or balding areas, is the next best thing,” says Dr. Yael Halaas, a New York facial plastic surgeon. According to Halaas, hair loss in men is genetic and they typically thin at the crown, frontal hair line and temples whereas women thin on the entire head which is accelerated by menopause. If surgical hair restoration is too pricey at $4,000 and up, another option is Rogaine. “It really works,” she says “but you don’t start seeing results until 6 months and the results go away if you stop using it.” The best method is to have the hair transplant and use Rogaine. Dr. Gary Alter, a plastic surgeon who is currently featured on Dr. 90210 with offices in both Beverly Hills and Manhattan says men tend to get their eyelids done. 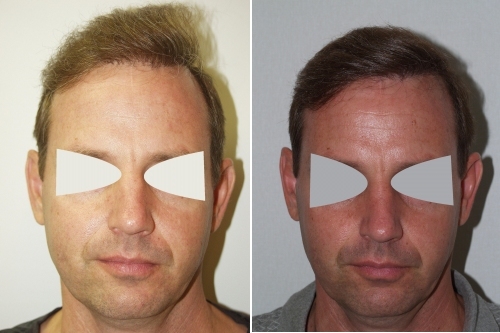 Men develop baggy upper skin on the eyelids as they age but with this procedure, they can look 5-6 years younger. Another popular procedure among older men is removing fat from their chest where extra tissue has developed. At the famous Skin Haven Spa in West Hollywood, California, owner Sharon Ronen has seen a growth in her male clientele. Since opening almost 3 years ago, her male clients has doubled from 15% to 30%. “People think only women and gay men treat themselves to facials and other spa services, but we have many straight men who are regulars,” she says. “Surprisingly, the men spend more time at the spa than women, and they’re also very loyal.” The most popular anti-aging treatments for men at the Skin Haven Spa are the Genesis Peel and the Enzyme Anti-aging Facial. The Genesis Peel very gently dissolves the top layer of dead skin cells to reveal fresh pristine skin while the Enzyme Anti-aging Facial contains patented proteins and enzymes that stimulate collagen and elastin to firm, plump, and lift the skin.